History of the temperance movement: 18th-century temperance thermometer by John Coakley Lettsom. 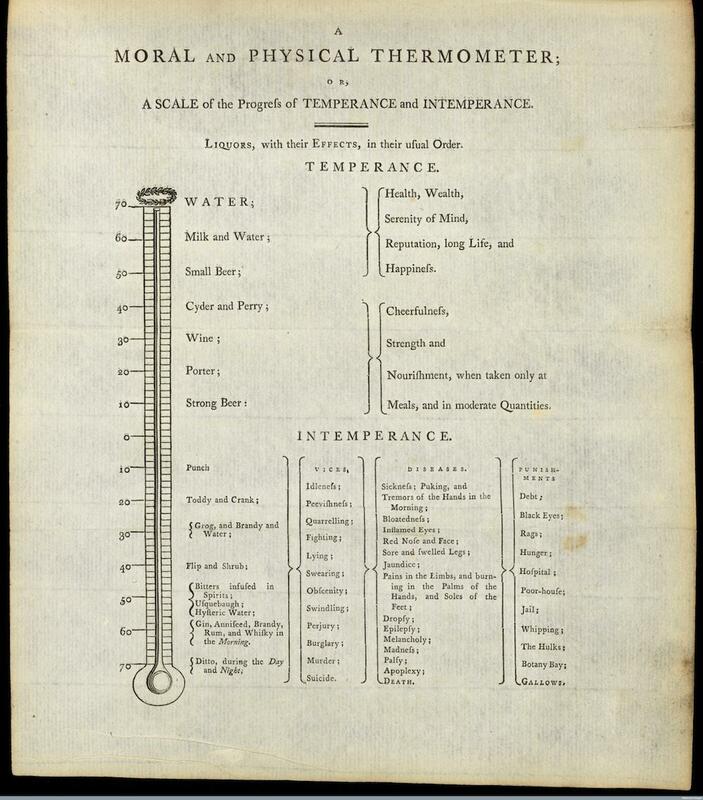 This “moral and physical thermometer” was published in English physician and abolitionist John Coakley Lettsom’s Hints Designed to Promote Beneficence, Temperance, and Medical Science, in 1797. A guide to correct use of alcohol, the “thermometer” followed the early temperance movement’s lead in endorsing moderate use of beer, wine, and cider, while predicting the direst of consequences for drinkers who indulged in anything stronger. The more familiar “temperance thermometer” is by Philadelphia physician (and signer of the Declaration of Independence) Benjamin Rush. Rush’s version appeared in his pamphlet “An Inquiry into the Effects of Spirituous Liquors in the Human Body” in 1784, and was republished many times. Lettsom and Rush were friends, having met when Rush underwent medical training in London as a young man; they carried out a lifelong correspondence. Among the causes that the two shared was the temperance movement, and it makes sense that Lettsom would adapt Rush’s idea for his own purposes. In Lettsom’s chart, certain items have been Anglicized (“punishments” include “the hulks,” or confinement to prison ships, and transportation to Australia’s Botany Bay). Lettsom also published an illustrated version of this chart, with scenes of benefits and punishments dramatically sketched. I first spotted this variant of the temperance thermometer on historian Lee Jackson’s Twitter feed. “Moral and physical thermometer,” John Coakley Lettsom, 1797.